According to statistics released by Russian Health Ministry, the number of children and teenagers who drink alcoholic beverages regularly in this country has increased threefold over the last 10 years. 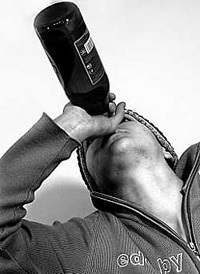 Moscow health officials have long regarded the teenage alcoholism as a serious problem for the city. In 2003, Russia’s only in-patient rehab for the treatment of young boozers was set up in a Moscow drug-abuse clinic No 12. Doctors at the ward have already treated 400 patients. The youngest patient was 7, the oldest one was 17. The hospital building is enclosed with an iron fence. There are bars on the windows and a security guard at the gate. The building was dubbed a “holding cell for underage drunks” by residents of a neighborhood in Leninski Prospekt, southeastern part of Moscow. Veronika Gotlib, director of the rehab, does not like the street name of it. “This isn’t a place for sobering up drunks. To a certain extent, it’s a unique institution where children receive comprehensive medical, psychological and social treatment,” says Gotlib. Indeed, the rehab resembles a boarding house in the country. A three-storey building is in good order, wards are airy and neat, with tulips held in the vases on the night tables. There is also a swimming pool, a computer class, and a cinema. Loud music is pumping from a recreation room. The 17-year-old ecstasy addict Valya is listening to his favorite rap singer. Valya wears a pony tail and his left ear is pierced with a little piece of silver. He is a student at a paramedical school, wants to be a plastic surgeon. Valya works as a tattoo and piercing artist at a beauty parlor in Arbat. He enjoys nightclubbing. One night he took his first synthetic hallucinogenic drug at the advice of his friends while having fun in a club. Valya says he “made friends” with alcohol when he was 11. He still remembers the fist time he got drunk. On a hot summer afternoon he downed a bottle of beer and passed out. “I’ve been taking tablets for six months now,” says Valya. “At the beginning I was pretty afraid of drugs. I used to tell my friends to steer clear of drugs ‘cause drugs will be the death of them one of these days… Now I really want to give up acid. That’s why I agreed to take treatment in this hospital,” says he. Not unlike many other young drug addicts and alcoholics, Valya was brought to hospital by parents. Some children are sent to hospital by the police or doctors at local drug-abuse clinics. Others, completely shellacked, are picked up on the city streets and railroad stations. Newly arrived patients in a state of intoxication usually receive a course of intensive therapy in a special room on the ground floor. Kids are put on a drip to “sober up” for several days. Doctors use words, not leather straps, for subduing the most violent ones. “The kids who run wild will swear at us and demand cigarettes. And they keep saying they’ll get away at the first opportunity,” says one of the instructors dealing with problem patients. “They also have their folks bring them some booze into the wards, but we seize such parcels and destroy them. Patients get away from the rehab from time to time, though patients are lodged in hospital of their own free will. Some kids slip away because they feel homesick. Others escape from the institution to get drunk or sniff glue because their addictions are hard to beat. Those teens usually get back to hospital, the only place where they can get real help. Pavel calls himself a “punk.” He got away from the rehab four times. Pavel is raised by his grandma. He used to be sniffing instant glue. Recently he has switched to drinking strong liquor. Pavel put it this way as he explained to the doctors why he came back to hospital: “You guys really cured me of my addiction to glue. Now cure me of my addiction to vodka, will you? A poster hanging on the wall above the door of Pavel’s ward says: “Everything will be fine if you don’t do drugs.” The poster, a makeshift piece of visual propaganda campaign for a healthy life, is made by the teenage patients who try to forget their troublesome past, their bouts of heavy drinking and cold turkey. The patients paint “curative” pictures and model self-portraits of modeling clay as part of therapy aimed at fighting negative emotions. Twelve teenagers including four girls with alcoholic dependency are treated in the rehab at the moment. Anya is a new entry, she is 16, a slender blonde who is hooked on “cocktails” and vodka. “It takes only three cans of cocktails (low-alcohol carbonated drink of inferior quality) or a bottle of vodka to get me drunk,” says Anya. Despite a rather tender age she is at, the girl has a bad record of alcohol abuse – she used to be drinking ‘cocktails” right after her studies were over. Asya, another patient of the rehab, is 15 years old. She took her first swig of beer at a party when she was 13. “I just couldn’t stop drinking since that goddamn night. I wanted to feel like a grown-up girl. My hands were shaking in a bad way as I woke up after partying all night. I didn’t go to school for quite a while. Now I’m gong to pull my act together. It’s my second time at the rehab,” says Asya. ‘Childrenwho receive treatment at our rehab vary by their social status, IQ, and education. As a rule, they belong to dysfunctional families, their parents themselves have drinking problems. Other kids’ parents are quite well-off, and those kids hit the bottle too,” says the instructor Irina Garkavtsova. “More than a half our patients drink alcoholic beverages. Even small children can become addicted to alcohol. One of our patients was just 7. You know, a bright-eyed boy with a pretty face. That would steal money from his dad and mom and ask older boys to buy him booze,” adds the instructor. The doctors at the rehab are especially concerned about a few patients who developed delirium tremens. “Delirium tremens was previously thought to be a final stage of the disease. Doctors used to rule out cases of D.T.’s in the ‘beginners’, not to mention children. But life proves the opposite. These days we have to deal with a generation that was heavily impacted by “quality advertising”. Today’s children take beer and cocktails in cans as an attribute of modern life. They don’t regard drinking as a shameful act any more,” says the director of the rehab Veronika Gotlib. - The number of people that die from alcoholism in Russia each year: 30-40 thousand.